The meaning of Letter of Acceptance is similarly defined by Federation International de Consulting Engineers (“FIDIC”) in its publication of various standard forms of construction contracts. The Letter of Acceptance is understood to be “the letter of formal acceptance, signed by the Employer, of the Letter of Tender, including any annexed memoranda comprising agreement between and signed by both Parties”. The definition similarly found in the subcontract terms are the same as the aforesaid mentioned Letter of Acceptance. However, adjustment should be made to reflect the sub contractual context. Accordingly, Letter of Acceptance means the letter of formal acceptance, signed by the Contractor of the Subcontractor’s Offer, including any annexed memoranda comprising agreement between and signed by both Parties. Playing an important part and having significant impacts/effect over the operation of the contract terms, Accepted Contract Amount is defined in Sub-Clause 1.1.4.1 that “the amount accepted in the Letter of Acceptance for the execution and completion of the Works and the remedying any defects therein”. In short, the Accepted Contract Amount is determined from the Letter of Acceptance. If the Letter of Acceptance does not specify the Accepted Contract Amount, the implementation of the contract, and the Works shall be adversely affected, provision of Performance Security, or determination to the exact amount of the Advance Payment to name as a few examples. Reality suggests that the issuance of the Letter of Acceptance is a conditional precedent to enable Contractors/Subcontractors to prepare and to provide to the Employer and the Contractor (respectively) the Performance Security based upon the Accepted Contract Amount. Obligations and responsibilities are adhered to, to avoid a breach of contract, which otherwise causes damages with respect to late issuance of the Performance Security. With the exception in which the Parties agree otherwise; the Letter of Acceptance holds priority (only after Contract Agreement). Entailing that the Parties have a standard foundation with which to perform and honor their respective obligations under the Contract. The Letter of Acceptance’s priority, in theory, advances to the level of a contract between the Parties – which reflects an agreement between the issuing party who issues Request for Proposal and the party proposing the Proposal. FIDIC’s approach to the concept of the Letter of Acceptance is recognized by Vietnamese law. Application of Civil Code 2015 provides for the concept of the Letter of Acceptance as: the Letter of Tender submitted by the Contractor or Subcontractor respectively to the Employer or Contractor is considered a proposal, the Letter of Acceptance made by the Employer or Contractor (respectively) for that proposal constitutes agreement between the Parties. Confirmation of the offer or proposal expresses acceptance made by the requesting party (the Employer or Contractor in context) to the service provider and confirms its acceptance of the offer/proposal in its entirety without any reservation or objection. And therefore not only considers the Letter of Acceptance as a contract/an agreement, but also the Letter of Acceptance also defines what documents form part of the agreement/contract and of course the validity of such agreement. Without a Letter of Acceptance, the expression Letter of Acceptance is understood as the Contract Agreement and the date of issuing or receiving the Letter of Acceptance is the date of signing the Contract Agreement. 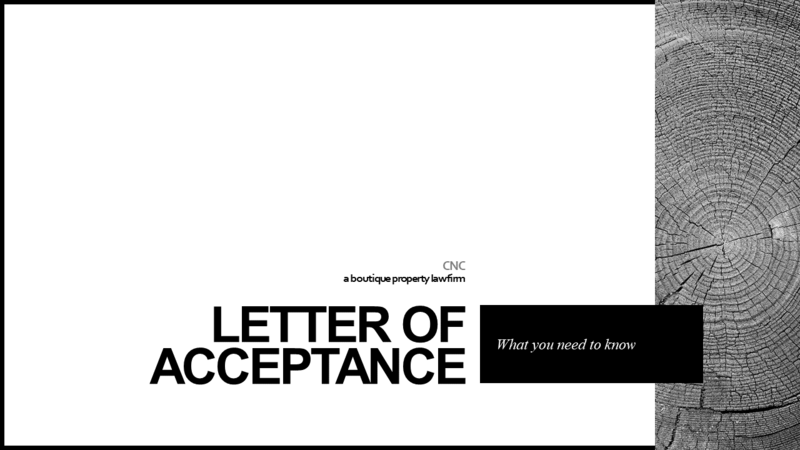 The importance of the Letter of Acceptance includes (i) the establishment of a contract between the Employer and the Contractor (or the Contractor and the Subcontractor); (ii) setting a foundation for contractual obligations to commence; and (ii) establishment of various commencement and completion dates under the Contract. Nevertheless, the majority of the General Conditions of the Contract, including the well-known FIDIC Rainbow Suite of Contracts – First Edition 1999 and its variants – does not specify which content is essential in a Letter of Acceptance. In particular, with the exception of the Accepted Contract Amount to be determined through the Letter of Acceptance, no provision in the FIDIC Red Book 1999 is found to include provisions concerning content of the Letter of Acceptance; i.e. no mechanism to determine essential elements of a Letter of Acceptance nor a sample of a Letter of Acceptance is included. The recent release of FIDIC Red Book/FIDIC Yellow Book 2017 a sample of letter of acceptance was introduced. However, the content of the specimen is relatively “simplified” and does not acknowledge important matters defining the relationship between the Parties. Any lack of foundational criteria – completion deadline(s), submission of performance security provisions, etc. – inhibit commencement of the Contractor/Subcontractor to obligations. Useless matters which already covers by the Conditions of Contract but now too much detailed or it breaks the principle rules to allocate risks between Parties under the Contract. All too often situations arise in which the Employer and the Contractor (or the Contractor and the Subcontractor) have not reached a consensus, which results in disputes and the resulting settlements of such disputes are cost and time consuming. Delays in project development are anticipated. A tainted reputation – of both parties – is likely to result – especially when such delays are more noticeably adverse than others. Acknowledgement by/of the Contractor/Subcontractor to the Letter of Acceptance. Consideration of the function of the Letter of Acceptance, is to (i) determine the Accepted Contract Amount; (ii) determine the required actions/obligations advised to be taken; (iii) record the mutual discussion and agreement of the Parties over various offers and counter-offers for strict compliance thereof; and (iv) enable the Parties to affect and maintain Performance Security, all in an effort to avoid unexpected disputes/disagreements. Therefore, in order to successfully implement the FIDIC Suite of Contracts, the preparation of (a) Letter of Acceptance templates, among due consultation with advisors (tender advisor, lawyers, project managers), must play an important role. We thank you for your Tender dated for the execution and completion of the Work consisting of the above-named Contract and remedying of defects therein – all within conformity of the terms and conditions outlined in the Contract. In consideration of appropriate and diligent performance of the Contract, we agree to disperse the Accepted Contract Amount or such other sums for which you may become entitled under the terms of the Contract, at such times and as prescribed by the Contract. We acknowledge that this Letter of Acceptance creates a binding Contract between us, and we undertake to fulfill all our obligations and duties in accordance with the terms of this Contract. In fact, we might come across other expressions having the same term “Letter of Acceptance”, “Letter of Award”, “Notice of Successful Bidder” v.v. See “Conditions of Contract for Construction for Building and Engineering Works Designed by the Employer, First Edition 1999, Second Edition 2017 – FIDIC Red Book”, “Conditions of Contract for Plant and Design-Build for Electrical and Mechanical Works and for Building and Engineering Works Designed by the Contractor, First Edition 1999, Second Edition 2017 – FIDIC Yellow Book”, “Conditions of Contract for Construction for Building and Engineering Works Designed by the Employer, MDB Harmonised Edition, June 2010 – Pink Book”, Conditions of Contracts for Design, Build and Operate Project, First Edition 2008 – FIDIC Gold Book” v.v. See “Conditions of Subcontract for Construction, First Edition 2011 for Building and Engineering Works Designed by the Employer (“FIDIC Subcontract 2011”), “Conditions of Subcontract for Construction, First Edition 2011 for Building and Engineering Works Designed by the Employer (“FIDIC Subcontract 1994”). See Sub-Clause 4.2 [Performance Security], FIDIC Red Book. See Sub-Clause 14.2 [Advance Payment], FIDIC Red Book. See Sub-Clause 1.6 [Contract Agreement], FIDIC Red Book; Sub-Clause 1.9, FIDIC Subcontract 2011. See Sub-Clause 4.2 [Performance Security], Sub-Clause 4.2 [Subcontract Performance Security] FIDIC Red Book, FIDIC Subcontract 2011. See Sub-Clause 8.1 [Commencement of Works], FIDIC Red Book. See Sub-Clause 8.3 [Programme], FIDIC Red Book. See Sub-Clause 20.1 [General Requirements for Insurance], FIDIC Red Book. See Sub-Clause 20.2 [Appointment of the Dispute Adjudication Board], FIDIC Red Book. See Sub-Clause 1.5 [Priority of Documents], General Conditions of Contract, FIDIC Red Book. Article 401.1, Civil Code 2015 provide that “once accepted, the contract shall take effect upon the signing, except otherwise agree by Parties or by law”. See Sub-Clause 1.1.1.3, FIDIC Red Book. See Sub-Clause 1.1.4.1 [Accepted Contract Amount], FIDIC Red Book. See Annex I [Specimens of Letter of Acceptance] annexed to the FIDIC Conditions of Contract, Second Edition 2017. Attachment (if any [See Sub-Clause 1.1.51].